What is the fashion bucket list, you may ask? It's the items you covet above all else -- the ones that, regardless of price, stay in your wishlist hoping to be bought and make your wardrobe the amazing thing it could be. Some may be drastically out of reach (a Marni necklace or Christian Louboutin pumps, anyone?) -- but they're the items that would make your wardrobe complete. I have quite a long list -- but these are the brands and items that keep calling my name. 1) Diane von Furstenberg: The fit is amazing, the clothes are gorgeous and I feel like a million bucks every time I put a piece on. I already own two tops and a pair of silk pants -- and I have a feeling it won't stop there. Right now I've got my eye on the Tabalah Dress -- I love the pattern and the color, and the fit is impeccable. 2) Rebecca Minkoff: I already have 3 handbags but am coveting EVERYTHING from the fall collection. EVERYTHING. Seriously, how cool is the Main Squeeze Clutch with its buckle detailing? 3) Marc by Marc Jacobs: The bags! The dresses! The whimsicality! I have two bags already, both of which have garnered tons of compliments over the years -- and multiple dresses that make me feel amazing. The fall collection is no different -- I'm especially coveting the French Terry Anorak (above), which is not only a highly trendy piece for fall but looks supremely cozy and chic. 4) Alexis Bittar: Every single piece makes a statement. I have two pairs of earrings and a ring, and I think my jewelry collection is severely lacking without at least 15 more. 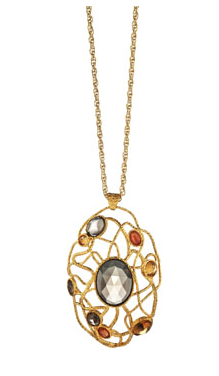 The Calder Gold Nested Smoky Quartz Oval Pendant is next on my list. 5) Chanel Quilted Lambskin Classic Flap Bag: This has been my dream bag for over 8 years. I've literally been coveting it since I first moved to New York and saw it in the pages of Harper's Bazaar every month (I used to be an editorial assistant there). While I may covet various bags, this is the one I NEED to create my perfect wardrobe. At over $1200, it's unfortunately out of my reach for now -- but maybe one day it won't be. What's in your fashion bucket list? Let me know in the comments!